About 2 weeks back it was confirmed that Samsung Galaxy S3 will be launching on the 3rd of May. Yesterday was it, the scheduled day for launching the phone of this summer. But yesterday only the Samsung Galaxy s3 model was officially revealed and 29th May has been set as the day for the release of this mega device. The Galaxy S III will be launched in Europe first followed by Asia, North America, and other parts of the globe. 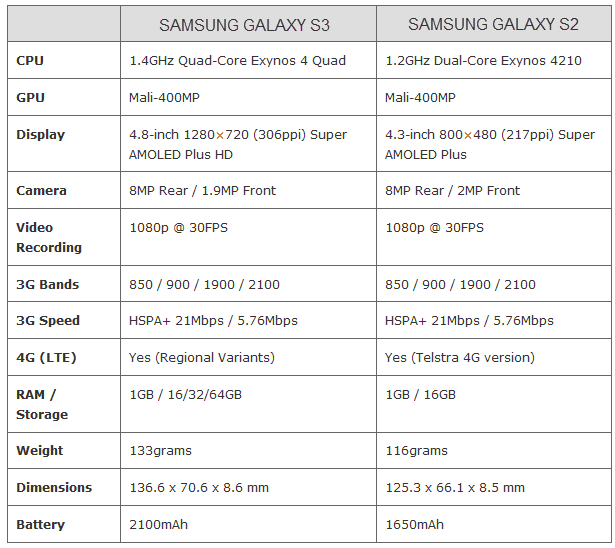 Also Read: Last week Samsung Unveiled the Galaxy S3′s Quad-Core Processor. Some days back, a group over at Tinhte.vn claimed that they have managed to get their hands on testing device of the Galaxy S III. The model that was described by them was a different one from the one officially released yesterday. Hence, The news turned out to be fake. According to The Verge, they believe that the 32GB model will be exclusively for Vodafone.The Galaxy SIII will be launching in 145 countries with over 200 partners in which North Amera, Korea and Japan will get the 4G versions, while the rest of the world will receive 3G ones. Note: The Galaxy S3 will cost £499.95 in the UK. The Galaxy S3 uses the front camera to track your eyeball movements to automatically detect if you are looking at the screen. The display will remain bright even if the device has been inactive for a long period of time. This is due a feature known as the Smart Stay which will determines whether you are reading an eBook or surfing the web. Samsung have developed its own voice recognition app called S Voice, more or less similar to that of Apple’s Siri. It will support 8 languages including English, German, Italian, Spanish, and Korean. It can be used to activate the phone, surf the web, launch apps, check weather, send email and SMS, manage appointments, and more. One disadvantage is that, unlike Siri, S Voice will not be capable of sophisticated natural language processing.It will have the capacity to understanding a set of voice commands that you will have to memorize. The Galaxy S3 has six sensors, and it will act effectively to understand your intentions. For example, If you are reading an SMS sent by your Dad, and then you hold the phone next to your ear, then the device will automatically understand that you wish to call your dad, and it will dial the number for you. There is also a smart alert system will alert you about missed calls by vibrating the handset the next time you pick it up. It has got the S Beam feature using which you can trasfer files between Galaxy S3 Devices at a amazing speed of 300Mbps. 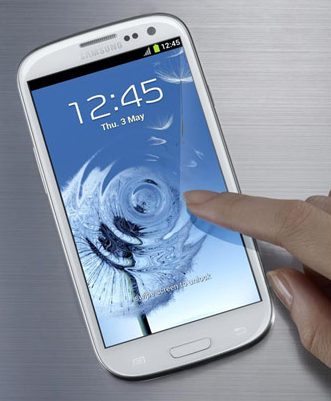 The Korean Tech giant came up with an official ad for the Samsung Galaxy S III. Have a look. Thanks to Bhavesh Khanna for the tip!